The consequences of the 3/11 compounded disaster were not distributed equally across the coastal towns, villages, and cities of the Tohoku region of Japan. Instead, the mortality rate varied tremendously, from zero up to ten percent of the local residential population. What accounts for this variation remains a critical question for researchers to answer and for policy makers to design effective disaster prevention frameworks. This paper uses a new data set including all tsunami-affected coastal villages to untangle the factors connected to mortality during the disaster. With data on demographic, geophysical, infrastructure, social capital, political, and economic conditions, we find strong effects of tsunami characteristics, social capital measures, and demographic conditions. These findings have important policy implications for future disasters in Japan and abroad. Mortality rates from the 3/11 compounded disaster varied tremendously across Japanese coastal villages vulnerable to tsunami. The mean proportion of the population missing or deceased following the tsunami was .002, that is, less than 2 in 1000 residents with a minimum of zero. However, the maximum was .09, that is, roughly 10 percent of the local population, which occurred in the city of Onagawa where more than 600 people perished. Initial data analysis on more than 280 coastal and non-coastal cities between Aomori and Chiba prefecture indicates that there is a strong connection between the height of the tsunami and mortality outcomes for towns, villages, and cities. 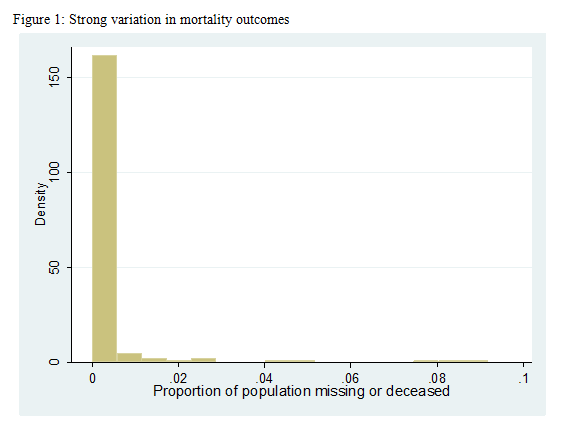 As Figure 1 below illustrates, the general pattern is that areas struck by higher waves had higher levels of mortality. However, the pattern is not perfect. 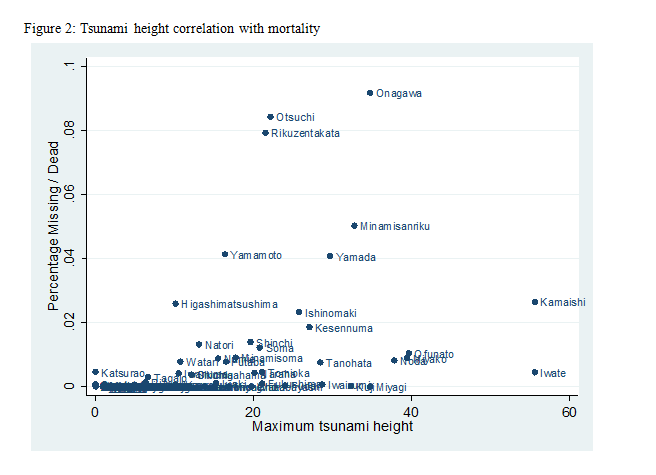 Some cities – such as Ofunato and Noda – with comparatively high tsunamis, had far lower mortality rates. The variation in mortality rates – which does not vary exclusively with the strength of the tsunami – remains a critical puzzle for researchers to understand. Past research has identified a number of factors which may strongly influence post-disaster mortality (Kahn 2005). These include disaster and local environmental characteristics, demographic factors, the capacity of local social networks, and political as well as economic factors. It is intuitive that the physical strength of tsunami – that is, its height and speed – strongly influenced mortality among affected communities. Disaster experts regularly connect the amount of damage done by a disaster like a tsunami or earthquake to survival and recovery rates (Dacy and Kunreuther 1969; Haas, Kates, and Bowden 1977). Hence the higher the tsunami at its peak as it approached a community, the greater the mortality. A great deal of work has focused on the role of demography in disaster situations, as characteristics such as age strongly correlate with the individual capacity to evacuate and survive a disaster. In their study of mortality and the Indian Ocean tsunami, Frankenberg et al (2011) found that physical strength best predicted survival, with children and older adults least likely to survive the disaster. Similarly, a study of the 2004 Indian Ocean disaster showed that the youngest and oldest were most likely to have been killed in the disaster (Rofi, Doocy, and Robinson 2006). A different approach to post-disaster mortality focuses on the ability of the community to self-organize under extreme conditions, to accurate receive and trust messages being sent out by authorities, and to provide informal insurance. Therefore pre-disaster levels of social capital – the ties that bind residents to each other – matter because of their influence on information sharing and collective action. Localities with the ability to overcome collective action can better facilitate evacuation of the elderly and inform; fragmented communities with less trust and less ability to work collectively may not been able to do so. Following much work in the field (Putnam 2000; Akcomak and Weel 2008; Buonanno, Montolio and Vanin 2009; Deller and Deller 2010), we use pre-tsunami proportional crime rates as a proxy for social capital. Finally, some experts on Japan have emphasized that political factors – such as local support for the long dominant Liberal Democratic Party, voter turnout, and whether or not the town was merged with another locality – may affect mortality. This can be expected because stronger support for the LDP may increase subsidies to local governments (Saito 2010). Similarly, stronger voter turnout may indicate greater capacity for the town residents to punish decision makers who fail to deliver needed services such as tsunami protection. Towns which have been merged may lack strong representation in local political arenas and/or lack strong identities which would drive them to seek out semi-private goods for their residents. Local political factors also affect public investments in and availability of reliable infrastructure for tsunami protection. To capture such environmental aspects for these communities, we utilize height information on sea wall constructed to guard localities against tsunami. This new, original dataset includes all coastal towns, villages, and cities in the Tohoku region of Japan; this includes Aomori, Iwate, Miyagi, Fukushima, and Chiba prefectures. The 280 communities in the dataset therefore include the entire universe of cases which could have been affected by the 11 March tsunami, and there is no need to reweight the individual observations or worry about truncated samples. Table 1 below describes the data used in this analysis. I run three models on the data to disentangle the factors which may have influenced mortality post-tsunami. 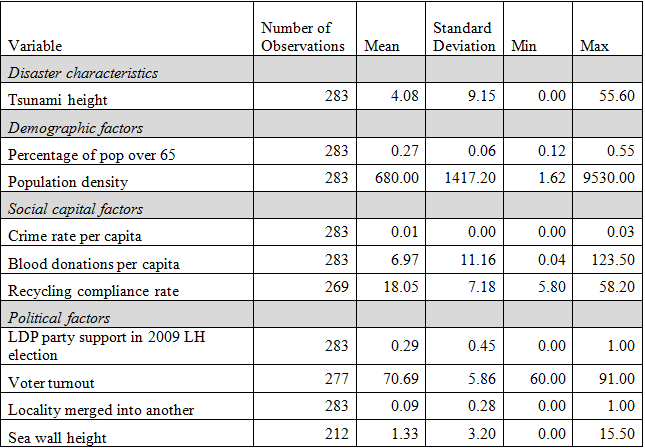 Table 2 below displays the estimated regression coefficients, the (robust) standard errors, and the p values. 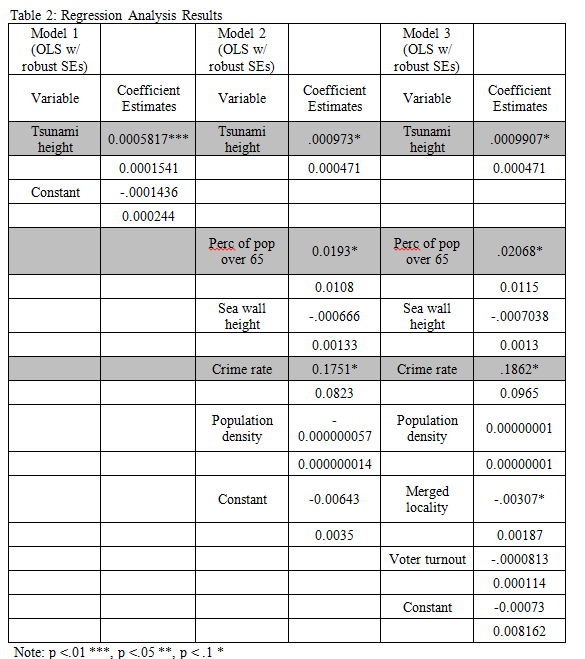 The first model (the vertical column at the left side of the page) includes only the height of the tsunami, while models two and three add in additional factors, including demographic, political, and environmental ones. I have highlighted that certain variables proved statistically significant across these models; these were the height of the tsunami, the proportion of the town or village aged 65 or older, and the proportional crime rate before the disaster. Because it is difficult to interpret these figures, I use simulation with confidence intervals to provide clearer ways of understanding the relationships between variables under study. Through taking random draws from our distribution and then expressing the degree of uncertainty around our predictions, we can move beyond standard tables of coefficients (King, Tomz, Wittenberg 2000). I begin by investigating the relationship between the height of the tsunami and the mortality rate in local affected communities. Figure 3 below shows how communities which had very short tsunami waves – fewer than five feet, for example –are predicted to have no casualties. The grey intervals are narrower where the distribution of data is greater, and wider where we have less information. As the tsunami height increases, though, casualty rates rise, to the degree that, ceteris paribus, a community experiencing a tsunami some 50 feet tall would have a mortality rate close to four percent. 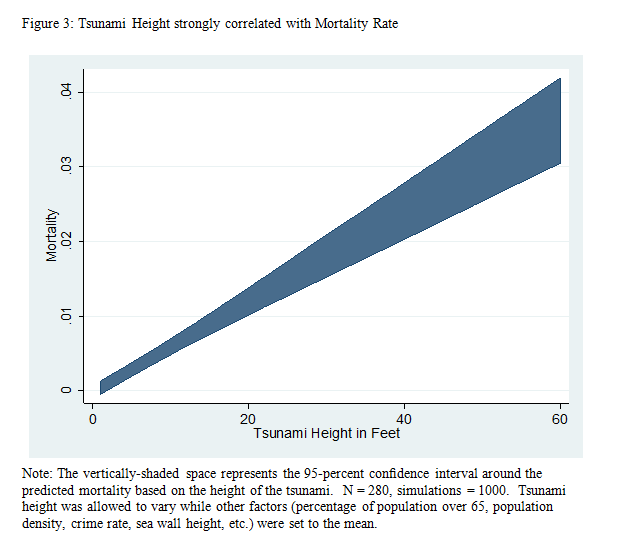 Because the tsunami height is beyond human control, the relationship shown in Figure 3 can be interpreted as a causal impact of tsunami on mortality. 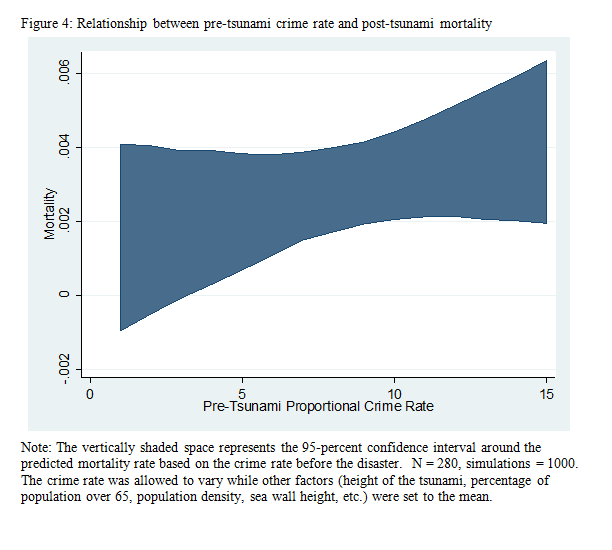 I now move to illustrate the connection between pre-tsunami crime rates and tsunami mortality outcomes. Figure 4 below shows, holding all other factors in the model constant, the relationship between the numbers of crimes per 1000 people and the rate of mortality afterwards. Unlike the initial simulation in Figure 3, Figure 4 has far wider confidence intervals around the predicted values. Despite the relative lack of data, there is a clear pattern: communities which had higher crime rates are predicted to experience greater levels of mortality. A village which had 15 crimes committed per 1000 people would be expected to have a death rate some 3 to 4 times higher than one where there were only 2 crimes per 1000 people. Finally, I move to demonstrate how demographic characteristics interacted with mortality. 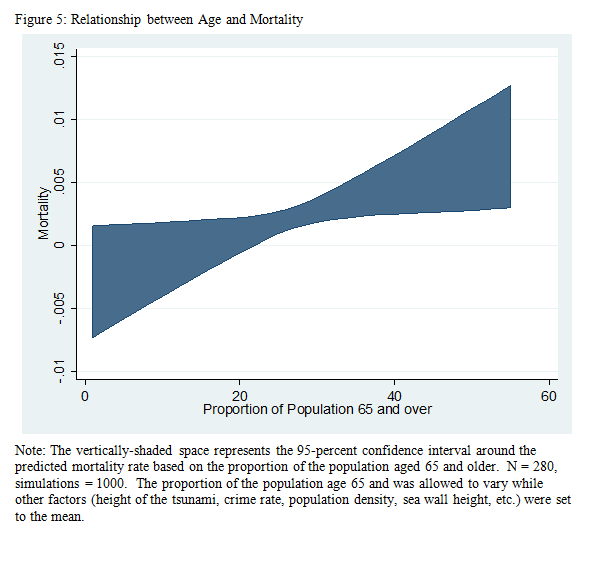 Figure 5 below shows the prediction that, ceteris paribus, having a community composed primarily of elderly individuals would result in a death rate close to 10 percent. As past research has indicated, because of the infirmity associated with age and the difficulties in evacuating elderly residents, there is a strong relationship between age and death rates. This paper found support for standard theories focused on issues such as the demographic characteristics of the local community and the strength of the tsunami itself. These outcomes were to be expected. However, beyond these prevailing factors, this paper found evidence that the strength of local social ties also mattered. As a new wave of research has sought to demonstrate, social capital and social ties play a critical role in disaster management and response (Elliott, Haney, Sams-Abiodun 2010; Hawkins and Maurer 2010; Chamlee-Wright 2010; Kage 2011; Aldrich 2012). Communities which had been plagued by low trust and high crime experienced higher rates of mortality because of an inability to self-organize during a critical period. Research has shown how very similar communities with different levels of mobilization potential responded very differently to the same disaster; this happened to the side-by-side neighborhoods of Mano and Mikura in Kobe, Japan. Following the 1995 earthquake, as fires broke out across the city, Mano self-organized fire brigades to fight the conflagration, while Mikura did not (Aldrich 2011). This initial investigation into the 3/11 compounded disaster found support for this recognition of the power of people. Aldrich, Daniel P. (2011). The Power of People: Social Capital’s Role in Recovery from the 1995 Kobe Earthquake. Natural Hazards Vol. 56 No. 3 pp. 595-611. Aldrich, Daniel P. (2012). Building Resilience: Social Capital in Post-Disaster Recovery. Chicago: University of Chicago Press. Akcomak, I Semih and Weel, Bas ter. (2008). The Impacat of Social Capital on Crime: Evidence from the Netherlands. IZA Discussion Paper No. 3603. Buonanno, Paolo, Montolio, Daniel, and Vanin, Paolo. (2009). Does Social Capital Reduce Crime? Journal of Law and Economics Vol. 52 pp. 145-170. Chamlee-Wright, Emily. (2010). The Cultural and Political Economy of Recovery: Social Learning in a post-disaster environment. London and New York: Routledge. Dacy, Douglas and Kunreuther, Howard. (1969). The Economics of Natural Disasters: Implications for Federal Policy. New York: The Free Press. Deller, Steven and Deller, Melissa. (2010). Rural Crime and Social Capital. Growth and Change Vol 41 No. 2 pp. 221-275. Elliott, James R., Haney, Timothy J., and Sams-Abiodun, Petrice. (2010). Limits to Social Capital: Comparing Network Assistance in Two New Orleans Neighborhoods Devastated by Hurricane Katrina. The Sociological Quarterly 51: 624–48. Frankenberg, Elizabeth, Gillespie, Thomas, Preston, Samuel, Sikoki, Bondan, and Thomas, Duncan. (2011). Mortality, the Family, and the Indian Ocean Tsunami, Economic Journal, 121:554:F162-82. Disaster. Cambridge, MA: MIT University Press. Hawkins, Robert, and Maurer, Katherine. (2010). Bonding, Bridging and Linking: How Social Capital Operated in New Orleans Following Hurricane Katrina. British Journal of Social Work 40(6): 1777–93. Kahn, Matthew E. (2005). The Death Toll from Natural Disasters: The Role of Income, Geography, and Institutions. Review of Economics and Statistics 87(2): 271–284. King, Gary, Tomz, Michael and Wittenberg, Jason. (2000). Making the Most of Statistical Analyses: Improving Interpretation and Presentation. American Journal of Political Science, 44 347–61. Rofi, Abdur, Doocy, Shannon, and Robinson, Courtland. (2006). Tsunami mortality and displacement in Aceh Province, Indonesia. Disaster 30 (3) pp. 340-350. Saito, Jun. (2010). Local government reform and the demise of the LDP. Prepared for presentation at the conference on Japanese Political Economy and the University of Tokyo, August 19-20. Daniel P. Aldrich is associate professor of public policy at Purdue University (USA) and Fulbright professor at Tokyo University (Japan). He has published the books Building Resilience (University of Chicago Press) and Site Fights (Cornell University Press) along with a number of articles, OpEds, and writings for general audiences on issues of NIMBYism, controversial facility siting, disaster recovery, and social networks. Please see his webpage at http://web.ics.purdue.edu/~daldrich/ and follow him on Twitter at @DanielPAldrich. Daniel, this is a very interesting analysis of social resilience in tsunami-affected areas. I want to ask about crime as a proxy for social capital. What kinds of crime are being measured in the data set? I wonder if disaggregating crime into various kinds (white collar and violent crimes for example) would lead to different results? It might be worth noting what sorts of crimes are captured by the crime rates used as a proxy for erosion of social capital, since some types of criminal activity can be highly organized and socially binding (yakuza being just one case in point). In financial disasters, for instance, criminal organizations sometimes assist capital flight. With regard to the point that communities need to trust messages sent by the authorities, do you have a sense as to whether the erosion of trust in official pronouncements about radiation exposure post-Fukushima Daiichi might affect trust in other arenas? For this reason, counter-intuitively, is it possible that some people might find tsunami warnings less trustworthy rather than more believable in the aftermath of 3.11 (not to mention the official who recently sent out news of a missile strike when he meant to send an earthquake warning)? Regarding the influence of demographics on tsunami mortality rates, it’s interesting that discussion in Japan has focused on age (though not surprising, given pervasive discussion of Japan as an ageing society). In work on post-2004 tsunami Sri Lanka, there’s also been lots of attention given to demographics, but it has focused more on gender differences. Women were more likely to die there, a fact that researchers have linked to a variety of factors, from having children in their arms to a cultural context in which they were less likely to know how to swim or climb trees (see Neloufer de Mel et al., eds., After the Waves; also Jennifer Hyndman’s work on the geopolitics of disasters). Also, the passage of time matters. So, I’m not surprised that vulnerability factors and strength of tsunami waves are both indicators of mortality–these are not mutually exclusive. High rates of pre-disaster vulnerability will predict that those who survive the waves will be in dire need of medical and evacuation services–I wonder if you can sketch the mortality stats out over time as a way to get at these effects? Daniel, as you say, there is a burgeoning literature on the importance of social capital in disaster resilience, and I think that your book _Building Resilience_ is probably the most forceful, comprehensive, and clearly articulated argument out there in favor of the thesis that social capital is one of the most critical determinants of a community’s resilience. I especially appreciate the way that you combine quantitative and qualitative analysis across several cases (in different times, places and languages) to support that thesis — few scholars are equipped to pull off such a feat. Speaking as a qualitative researcher, I think it is awesome that your quantitative analysis supports not only your own qualitative research but the ethnographic work of other researchers as well. This piece on Tōhoku is certainly consistent with the findings of your earlier work. Can you elaborate on what the data suggest about the effects of municipal “gappei” (merging) on mortality? You mention it early on but I wasn’t clear about the conclusions you reached regarding that. I’m interested because I frequently hear complaints, from residents of towns that were annexed, that they have received subpar service from their respect municipal administrations, which they claim is negatively affecting the recovery. It makes sense, but I haven’t actually seen any concrete evidence of this. An important part of the argument in your book, which by virtue of brevity is necessarily missing here, is an extensive discussion of the considerable challenges in rigorously defining and operationalizing an elusive, multifaceted concept like “social capital,” including a defense of the use of certain proxy variables to enable quantitative analysis. Now, I have to admit that you didn’t completely convince me that “social capital,” in its full, holistic grandeur, can be analyzed in this way; I still think that it is more persuasive to analyze its specific constituents instead. And I think this is especially the case for a short piece like this one here, in which you are asking your readers to accept that crime rate, for example, is a proxy for “social capital.” Without either that extended discussion or a more focused approach, I think you are more likely to get a lot of questions about the appropriateness of certain data in your analysis, or indeed about whether you can use such selective data to support an argument for something as broad as “social capital” as a whole. Actually, I also had some questions about some of the data you used, though none that would really challenge your analysis. That said, the title of your paper suggests that it is about “recovery,” while the key data you use is mortality rates, including deaths from the initial impact of the tsunami on March 11, and I wonder about the connection between that data and the category of “recovery.” How would your paper be different if you either removed “recovery” from the title, or only looked at mortality rates from March 12 onward? I have another queston about data that comes more from curiosity than anything else. One of the things that surprised me when I first saw maps of tsunami heights was the fact that there are at least a couple of different ways that “tsunami height” can be measured — inundation depth and runup height. From the maximum figures in your piece, it looks like you are using runup height as your measurement of choice when you can (presumably for the towns on the ria coast); is that correct? Of course, in the plains there is no “runup,” so I would assume you use inundation depth there. I doubt that mixing the two measurements vs. using only one type would affect your conclusions, but I was curious about how you found and selected the data to use. Along the same lines, I am also wondering why you selected those particular prefectures instead of just the three most heavily impacted ones, since many other prefectures you didn’t mention also experienced the tsunami. Again, I don’t think it would change your conclusions one way or another; I’m just curious about your process. Since you invoked the famous cases of Mikura and the Mano fire-suppression brigade, I want to give a shout-out to Etsuko Yasui, whose 2007 dissertation on “community capacity” in those two districts very much foreshadowed much of the more recent work on “social capital” that you cite. In fact, I think that her “community capacity” looks a lot like “social capital” under a different name. You cite Yasui extensively in your book, and I want to mention her work here as well for the benefit of our workshop colleagues who might be interested. Finally, I want to reiterate that I do generally agree with your overall argument as to the importance of social capital (in some form or another) for community resilience. Another thing that I liked in your book was your suggestions, in the final chapter, of concrete policies that might cultivate different aspects of social capital in communities. Given the history of social and economic decline over the past couple of decades in many of the tsunami-affected communities of Tohoku, I wonder whether any such steps can be taken in the recovery which would be effectively able to reverse these trends. Are there any in particular that you would recommend, either to policy makers or to local communities themselves? I suspect that the key issue re crime — especially for audiences not familiar with Japan — is to sketch out the non-violent nature of much crime in Japan (murder, for example) and its comparatively small numbers so people don’t think about crime as seen in American communities. Context will be important. In dealing with crime, one possible element (at least in the discussion of Kobe) worth discussion is the potential role of yakuza. It is a “local” organization that has the capacity to serve useful purposes; the question is whether there is any indication that it does? Although I have never explored the issue, occasional discussions with older Japanese over the year suggest that in the immediate post-war years, some positive community benefit came from this source. I guess that the social capital will also have strong effect to recovery speed after 3.11 disaster. However, I,as Japanese scholar, should not to wait to demonstrate it relations as a observational research, but find the way to reduce the gap and narrow its causes through action research. Thank you for this very important paper. I understand that theses results are part of a larger project, but I was curious to know if you have addressed the gender factor in the construction of the mortality rate. What I was told, as a NGO worker in the Aceh province (Sumatra) following the India Ocean Tsunami, was that women had paid a larger tribute that men. I do not have data to confirm or infirm this claim, but it was a very common one at the time. Instead of running away from the wave people recalled seeing women running toward it, trying to grab children or older people. This kind of story would come back often, accompanied with great sadness but also a sense of pride. After the Tsunami, the death of so many women had also deep implications in the transformation of the weeding rituals. Young women were soon after married to widowers by the community leaders to, as I was told, helps and fastens the recovery process. This to say that mortality distribution is important because it impact deeply the core ‘anthropological’ functioning of the impacted communities. I was also curious to know if you have coined your ‘social capital’ concept within a bourdieusian framework in mind and, if so, how do you connect it with the different trends of the STS. I really enjoyed this paper! Thank you very much for sharing the work. I would like to know more about the “availability of reliable infrastructure for tsunami protection.” Along with the height of sea wall constructed to guard localities against tsunami, would you be interested in considering evacuation routes as a part of reliable infrastructures for tsunami protection? I do not have any data or theory, but the availability of evacuation routes may also be a part of the factors that may have influenced mortality following the disaster. Again, thank you very much. It was fascinating to read that your dataset covers all coastal villages not only among the three prefectures, but from Aomori to Chiba. I wonder if you had considered educational factors that may have contributed to reducing reducing moratlity rate when the tsunami reached these villages. For example, the “miracle of Kamaishi” in Iwate prefecture – which I’m sure you’ve come across already -showed how local teaching of “Tsunami Dendenko” saved lives of all elementary and middle school students that were in attendance on 3.11. How do you see the role of such disaster education? Daniel – your work here is rich with unexpected insight and, as with your book Building Resilience, weaves together a number of variables that influenced mortality in the disaster. I’m interested to hear more about the correlation between these variables, and how you can extract causal influence given the complexity of these interlaced factors. It will be useful to see what policy recommendations may be derived from your analysis. It is refreshing to see work that, like your prescient book Site Fights, is data-driven, empirically grounded, and historically resonant. Interesting paper, and interesting question as to why the rates of mortality varied among the villages, but the causality argument for social capital may be a stretch. Likely other factors such as the flow of information may have had an equally important influence on enabling people to evacuate, the timing and accuracy of the tsunami warnings, information infrastructure, degree of public education regarding tsunamis, and professional training of local emergency responders. Size of the community may also have a significant influence, with smaller communities less able to have professionally trained emergency responders or public education programs for their communities.